﻿Bu çalışma, Türkiye üzerine Dünya Değerleri Anketi (WVS) verilerini kullanarak, insan sermayesinin kalitesi ve dindarlık açısından yaşam memnuniyeti ve mutluluğuna ilişkin belirleyici faktörleri ampirik olarak araştırarak literatüre katkı sağlamaktadır. Temel bulgular şu şekilde özetlenebilir: (i) yüksek beceri (vasıflı) ve daha yüksek gelir sahibi insanlar mutsuz olmaya ve yaşamlarından memnuniyetsiz olma eğilimindedirler; (ii) yüksek öğrenim düzeyi olan, istihdam edilen ve kaderlerinin kendileri tarafından şekillendirildiğine inanan zihin gücüyle çalışan (bilişsel) işçiler hayatlarından daha memnundurlar, çok sayıda çocuk sahibi ve yüksek beceri düzeyine sahip emek (kol) gücüyle çalışan işçiler ise hayatlarından daha az memnundurlar; (iii) bireysel ve toplumsal dindarlık faktörü emek gücüyle çalışan işçilerin mutluluk ve yaşam doyumu üzerinde güçlü bir olumlu etkiye sahiptir. Bulgularımız bireysel mutluluk ve yaşam memnuniyetini tahmin etmede cinsiyet, yaş ve medeni durum gibi temel bir demografik değişken grubunun belirleyiciliğini de doğrulamaktadır. 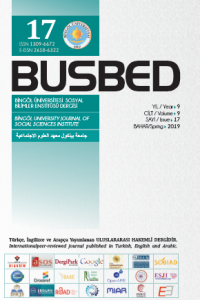 This paper contributes to literature by investigating empirically the determinant factors on life satisfaction and happiness with respect to the quality of human capital and religiosity by using World Values Survey (WVS) data on Turkey. The key findings are that: (i) people with high skills and higher income tend to be unhappy and unsatisfied with their lives; (ii) cognitive workers who have higher educational attainment, who are employed, and who believe that their fate is shaped by themselves are more likely satisfied by their lives; whereas manual workers with high number of children and with higher skill level are less satisfied; (iii) individual and social religiosity have also a strong positive impact on happiness and life satisfaction for manual workers. Our findings also confirm the importance of a core set of demographic variables in estimating the individual happiness and life satisfaction such as gender, age, and marital status. ALLARDT, E. (1993), Having, Loving, Being: An Alternative to the Swedish Model of Welfare Research. In: M.C. Nussbaum and A. Sen (Eds.). The Quality of Life (88-94). New York: Oxford University Press. BLANCHFLOWER, D. G. and OSWALD, A. J. (2004), Well-Being Over Time in Britain and the USA. Journal of Public Economics, 88(7-8), 1359-1386. BÖCKERMAN, P. and ILMAKUNNAS, P. (2005), Elusive Effects of Unemployment on Happiness. Discussion Papers. Labour Institute for Economic Research: Helsinki School of Economics and Research (HECER). Discussion Paper No. 47. ISSN 1795-0562. CLARK, A. and OSWALD, A. J. (1994), Unhappiness and Unemployment. Economic Journal, 104(5), 648-59. DEATON, A. (2008), Income, Health, and Well-Being around the World: Evidence from the Gallup World Poll. Journal of Economic Perspectives, 22(2): 53-72. DELHEY, J., BÖHNKE, P., HABICH, R. and ZAPF, W. (2002), Quality of Life in a European Perspective: The EUROMODULE As a New Instrument for Comparative Welfare Research. Social Indicators Research, 58, 161-175. DIENER, E. and SUH, E. M. (1997), Measuring Quality of Life: Economic, Social and Subjective Indicators. Social Indicators Research, 40, 189-216. DIENER, E., SUH, E. M. and LUCAS R. E. (1999), Subjective well-being: Three Decades of Progress. Psychological Bulletin, 125, 276-302. DOCKERY, A. M. (2003), Happiness, Life Satisfaction and the Role of Work: Evidence from Two Australian Surveys. In: Carlson, Ellen (Editor). Full Employment Imperative, The Callaghan, NSW: University of Newcastle, Centre of Full Employment and Equity, (77-95). Availability: https://search.informit.com.au/ documentSummary;dn= 068898448735854;res=IELBUS, ISBN: 192070132X. EASTERLIN, R. (1974), Does Economic Growth Improve the Human Lot? Some Empirical Evidence. In Paul A. David and Mel W. Reder (eds. ), Nations and Households in Eco-Nomic Growth: Essays in Honour of Moses Abramovitz (89-125). New York: Academic Press. EASTERLIN, R. A. (1995), Will Raising the Incomes of All Increase the Happiness of All?. Journal of Economic Behavior and Organization, 27(1), 35-48. ELLISON, C. G. (1991), Religious Involvement and Subjective Well-Being. Journal of Health and Social Behavior, 32(1), 80-99. FEATHER, N. T. (1990), The Psychological Impact of Unemployment. New York: Springer-Verlag. FRANK, R. H. (1985), Choosing the Right Pond. New York: Oxford University Press. FREY, B. S. and STUTZER, A. (2002), What Can Economists Learn from Happiness Research?. Journal of Economic Literature, 40, 2, 402-435. GOLDIN C. (2016), Human Capital, in: Handbook of Cliometrics. Heidelberg, Germany: Springer Verlag. GRAHAM, C. and PETTINATO, S. (2001), Happiness and Hardship: Opportunity and Insecurity in New Market Economies. Washington, DC: Brookings Institution Press. GRANZIN K. L. and HAGGARD L. M. (2000), An Integrative Explanation for Quality of Life: Development and Test of A Structural Model. In E. Diener and D.R. Rahtz (eds. ), Advances in Quality of Life Research (31-63). London: Kluwer. HAYBRON, D. M. (2000), Two Philosophical Problems in The Study of Happiness. Journal of Happiness Studies, 1:2, 207-225. INGLEHART, R. (1990), Culture Shift in Advanced Industrial Society. Princeton, NJ: Princeton University Press. JAHODA, M. (1982), Employment and Unemployment: A Social-Psychological Analysis. Cambridge: Cambridge University Press. KOZARYN, A. O. (2009), Religiosity and Life Satisfaction; A Multilevel Investigation Across Nations. Draft report, Institute for Quantitative Social Science, Harvard University. MORAWETZ, D., ATIA E., BIN-NUN, G., FELOUS, L. GARIPLERDEN, Y., HARRIS, E., SOUSTIEL, S., TOMBROS, G. and ZARFATY, Y. (1977), Income Distribution and Self-Rated Happiness: Some Empirical Evidence. The Economic Journal, 87(347), 511-22. NG, Y. K. (1996), Happiness Surveys: Some Comparability Issues and an Exploratory Survey Based on Just Perceivable Increments. Social Indicators Research, 38(1), 1-27. NOLL, H. H. (2002), Towards a European System of Social Indicators: Theoretical Framework and System Architecture. Social Indicators Research, 58, 47-87. OSWALD, A. J. (1997), Happiness and Economic Performance. The Economic Journal, 107(5), 1815-31. ÖZCAN, K. M., BÖKE, S. S. and KARA. M. (2008), The Determinants of the Perception of Happiness about Quality of Life amongst Turkish People. Economic Research Forum. Working Paper Series No.425. RAHMAN, T., MITTELHAMMER, R. C. and WANDSCHNEIDER, P. (2005), Measuring the Quality of Life across Countries: A Sensitivity Analysis of Wellbeing Indices. WIDER Research Paper No. 2005/06. RAPLEY, M. (2003), Quality of Life Research-A Critical Introduction. Sage Publications, London. SIRGY, M. J. (2001), Handbook of Quality of Life Research: An Ethical Marketing Perspective. The Netherlands: Kluwer Academic Publishers. STREIMIKIENE, D. and GRUNDEY, D. (2009), Life Satisfaction and Happiness - the Factors in Work Performance. Economics & Sociology, 2(1), 9-26. TSOU, Meng-Wen and LIU, Jin-Tan, (2001). Happiness and Domain Satisfaction in Taiwan. Journal of Happiness Studies. 2 (3), 269-288. VEENHOVEN, R. (1991), Questions on Happiness: Classical Topics, Modern Answers, Blind Spots. In Strack, F., Argyle, M. and Schwarz, N. (eds.). Subjective Well-Being: an interdisciplinary approach (7-26). Great Britain: Pergamon Press. VEENHOVEN, R. (2001), What We Know About Happiness. Paper presented at the dialogue on 'Gross National Happiness', Woudschoten, Zeist, The Netherlands, January 14-15 2001. VINSON, T and ERICSON, M. (2012), Life Satisfaction and Happiness. Richmond, Australia: Jesuit Social Services. WARR, P. B. (1987), Work, Unemployment and Mental Health. Oxford: Clarendon Press. WINKELMANN, L. and WINKELMANN, R. (1998), Why Are the Unemployed So Unhappy? Evidence from Panel Data. Economica, 65 (257), 1-15.